﻿ How Self Awareness can Improve Effectiveness in the Workplace? How Self Awareness can Improve Effectiveness in the Workplace? How often have you sat down and considered in detail who you are working with, what makes them tick, what motivates them and what makes them different to you? Have you ever considered tweaking your behaviour to improve the working relationships you have with different team members? Quite possibly if you or your boss have been on some kind of training which requires you to complete a psychometric test you may have some awareness but how often do you then consider what you have learnt and how can you embed this into your daily working practice? As we grow our parents/carers tell us to treat people the way that we would like to be treated. In terms of kindness and respect I couldn’t agree more but what makes me tick is very different to what makes others tick and so I truly believe in ‘treating people the way that they want to be treated’ especially in the workplace. These people tend to be dominant, driven, direct, demanding, decisive and determined. These people are motivated by power and authority. These people tend to be inspirational, influential, interactive, impulsive, interested in people and impressionable. These people tend to be motivated by praise and recognition. These people tend to be steady, stable, supportive, sensitive, sentimental with a need for security. These people tend to be motivated by security, peace and harmony. These people tend to be cautious, calculating, competent, compliant, conscientious and careful. These people are motivated by systems and procedures. Organisations are made up of all of these styles and a balance is essential to the growth of any successful business – a business full of mainly outgoing and people driven individuals will struggle to be effective. However, we are rarely just one style, we will have characteristics from all styles within our working personality but we will most certainly have a dominant style. The questions we need to consider are ‘what kind of personalities are in my team’ and ‘how can I adapt my style to get more from the relationships with these individuals’. From how you communicate with each other both in person and via email to the speed at which you deliver your results, the more awareness you have about others and their style preferences the more effective you can be. 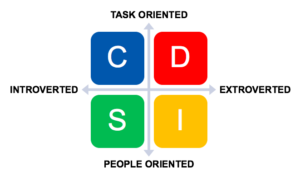 A very simple example of this came one day when I was delivering a Personal Effectiveness training course to a team. I asked the question “who likes the fluff in an email?” Several people put their hand up and commented that they really liked a nice intro from the sender before they start discussing work stuff (many were ‘I’s). Several pointed out that obviously, it depended on the relationship and subject of the email but there was one person who stood out and she was the manager and a clear ‘D’ style. She said she did not care for the fluff, she did not see the need for it, she just got straight to the point regardless of who she was communicating with. The discussion that followed highlighted very clearly the different styles that existed within this team and it most certainly made the manager more aware of how her emails are received by others. None of this is rocket science but having a greater awareness of yourself and the others around you can most definitely improve effectiveness within any team. Consider for each person (including yourself) what motivates them, what is their communication style and what are their general characteristics. For yourself, consider your own personal growth areas, for example ‘D’ styles can show greater support for other members of the team while ‘I’ styles can talk less and listen more.